10K, Half Marathon, and Full Marathon Training for the Spring Madison Marathon Events and Green Bay Marathon! Fleet Feet Sports and Orange Shoe Personal Fitness are teaming up once again for our annual Force of Orange training program! All levels of running experience are welcome! 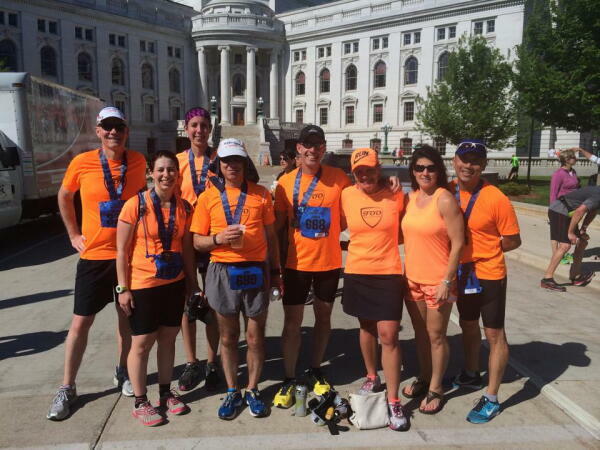 This program is tailored to getting participants to the Madison 10K, Half Marathon, and Green Bay Full Marathon. However, you are welcome to join us if you are preparing for another spring running event. Thanks to our vendor sponsor adidas for sponsoring this great program! Not sure if FOO group training is right for you? Join us for some pre-training runs (FREE!) to gain insight into the FOO experience! TRAINING PROGRAM RATES*: Online Registration Closed-Call 608-833-9999 for late registration details. Weekend meeting locations will rotate between west, central, and east areas of Madison. Wednesday group runs will be centrally located in Madison. All participants registered for FOO 2014 by February 2, 2015 will receive pre-program build-up schedules to work on individually to help prepare for the first group run on March 1, 2015. Due to the duration of the training program (12 weeks in total), those interested in the full training are STRONGLY ENCOURAGED to register by February 2, 2014 in order to receive the pre-program schedule to build safely and properly for the first FOO group run. For those registering after February 2, 2015, you will receive the pre-program build up schedules shortly after registration. Become a Force of Orange Pacer! We are currently recruiting pacers for our Force of Orange Training Program! If you have experience running various half marathons and/or marathons, enjoy motivating other runners, and are able to run with enthusiasm, dedication, and commitment please Email Megan for an application. Program pacers receive free program entry (not including race entries), product compensation, pace team perks, and the priceless feeling of helping your fellow runners achieve their goals! Pacers are required to attend a mandatory training session TBD before the training program begins.